Decarboxylation is an important yet often misunderstood aspect of cannabis consumption. Decades of prohibition have allowed incomplete, inaccurate, or just plain wrong information about decarboxylation – hurting not only medicinal patients, but the cannabis movement as a whole. To shed light on this topic and combat farce with data, we’ve compiled our clinical research on decarboxylation to address the most common decarboxylation myths. Our aim here at Ardent is to expand access and acceptance of cannabis for health and wellness. We doing so by investing in research to disperse the myths and present the facts. This guide will cover the 6 most common decarboxylation myths – make sure to download the FREE ebook below to share with friends! Myth 1: Fresh and cured bud needs to be treated differently when it comes to decarboxylation. Myth 2: It’s impossible to get more than 70% Decarb before you start to destroy THC. Myth 3: It’s easy to decarboxylate just using what’s in your kitchen. Myth 4: Concentrate decarboxylation is different than flower decarb OR you can only decarb concentrate by watching CO2 bubbles evaporate. 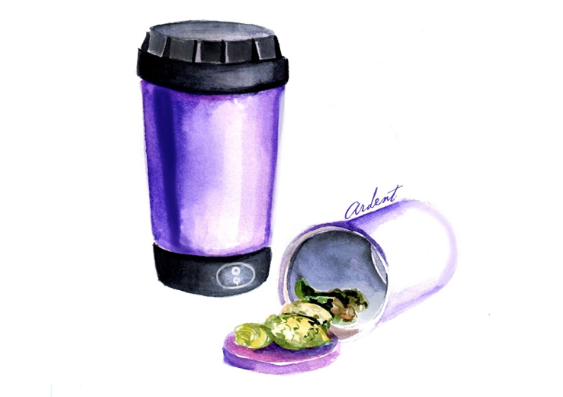 Myth 5: It’s necessary to grind cannabis before decarboxylating. Myth 6: Fats and alcohols are required to prepare cannabis. Decarb is a function of time, temp, and atmosphere. The process fully activates the THC in your cannabis to a much higher potency than traditional methods of consumption (i.e. smoking). However, it isn’t as simple as sticking bud into an oven, toaster, crockpot, or even lighting it on fire. Fully activating without destroying valuable cannabinoids is a scientific and precise process. Done correctly, you get more out of cannabis and have infinite ways to use it. This is exactly why we developed a decarboxylator that encapsulates all of the science and transforms a complicated process to one that is easy, discreet, and reliable. We realized pretty quickly though, that many years of misinformation still left a lot of patients confused about decarboxylation and the right way to approach cannabis in general. So we’ve compiled answers to some of the top questions we’ve encountered, to shed some light on these processes in order to make those parts simple too. All of these are myths. Fresh bud can be decarbed easily in the right conditions, in fact, it’s a good way to preserve more terpenes in the final product (think about the smell of fresh vs. dried flowers). Decarbing fresh bud takes no less or more time to decarb as cured bud in a controlled setting. And (most importantly!) properly cured bud has not been decarboxylated as a function of the drying and curing process. In these examples above of dried and cured cannabis flower, notice that proper curing never leads to significant decarb. No more more than 1% THC observed, average range of 0-6% of total available THC decarboxylated. Only when cannabis has been improperly stored and exposed to excessive light and heat is it slightly more decarb and/or degradation, and even in those extreme circumstances the decarb is nowhere near complete. Fact: All bud, fresh and cured, needs to be decarbed in order to be active and bioavailable. Decarbing fresh and well-cured bud involves the same process. This myth comes from one of the most widely promoted and most inaccurate decarb fables and it stems from this often referenced yet largely inapplicable graph. For many years the inhabitants of the internet have treated this graph as gospel. A quick review readily shows why it’s not a reliable source. First, it’s the decarb of a hexane extract in an open container on a hot plate. And yes, with this material in these circumstances you can’t get full Decarb without destroying THC. Fact: We can do better than relying on an inapplicable graph from the early 90’s. And we know it’s possible toget full Decarb without degradation. Read on. It’s hard out there for patients. When they want to start using cannabis they encounter wildly different opinions on the best way to decarb and long and detailed instructions on how to get it right. Crockpot for 3 hours. Wait, or is it crockpot for 12 hours? Really how can a patient not be overwhelmed? In the end, not one of these methods allows patients to reliably get the most of their cannabis, and it’s important to understand why. One of the most popular methods, the idea behind using the crock pot/water bath method is that water boils at a constant temperature (212F) and provides better control than the fluctuations of the oven. Unfortunately, the temperature of boiling water will never be hot enough to achieve an efficient and full decarb. Decarb at this temp progresses slowly, and because decarboxylation is not a linear process (meaning that converting the tail end of the THCA takes longer) we begin to see degradation due to the excessive time exposed to heat. Ovens aren’t designed for lab grade precision heating, and within an oven cavity temperatures fluctuate an average of 10 degrees in either direction. For a process as sensitive as decarboxylation, these variations lead to either burning off cannabinoids or failing to fully activate. In either case it’s a waste of valuable money and medicine. Similar to the oven, the toaster oven’s lack of tight temperature control coupled with the operation and location of heating elements can easily damage bud or under-decarb, making it impossible to get reliable results. Equipped with advanced logic, dual sensor technology and a hi-tech thermal blanket, Nova uses precision heating cycles to achieve full decarb without loss. Fact: Kitchen appliances aren’t equipped to create the conditions needed for full, reliable decarb, so we developed a device that is. Concentrates that have been prepared professionally, extracted and purged under the right conditions have not been decarboxylated and need to be activated before being ingested or used topically. The time and temperature parameters for the best flower decarb also apply to concentrates. As seen below BHO extracts can become slightly more concentrated during decarb, likely from evaporation of residual solvents and moisture. Like with properly cured and stored cannabis flower, properly prepared and purged concentrates have undergone little or no decarboxylation, less than 5% of total THC decarbed. Fact: Decarbing concentrate involves the same science as decarbing flower. We actually suggest that you don’t. This myth arose as an attempt to provide more even heating and combat temperature fluctuations when using the oven for decarboxylation. With precision decarb, there’s need to disturb the trichomes by grinding. The Nova’s thermal blanket permeates the buds evenly, and intact buds provide more options for use post decarb and increases the longevity of the material. All Nova tests feature non ground material. Fact: There’s no need to grind cannabis before precision decarb, and leaving the trichomes intact can increase shelf life. There is no doubt alcohol and fats can be helpful for preparing and administering cannabis in certain circumstances, and we’ll get to that. But to start, there’s an overemphasis on the role of alcohol or fat extraction that leads to patients unnecessarily spending hours, days, and even weeks preparing their medicine. It’s easy to understand the origins of this myth, because it is based in science but often misapplied. It’s true that cannabis is fat and alcohol soluble but not water soluble, meaning that THC won’t seamlessly bind and mix with a water based substance the way it will with a fat and an oil. Somehow this fact has been twisted into an insistence that patients need to extract into butters and oils or use an alcohol-based solvent. Unfortunately for patients, these processes are complicated, time-consuming, and in the end, inaccurate. It much easier for patients to activate flower or kief and use it directly. It’s possible to bypass all the hassle and prevent waste, all while getting the full benefits of a whole plant therapy. Direct activation and infusion gives so many more options on how cannabis can be used, and allows patients to quickly create accurate topicals, sublinguals, and edibles. The instant substitute for hours of extraction: take the dose of decarbed flower or kief and mix it with 1/2tb of good fat like coconut oil and administer. Substitute butter if you prefer. The purpose of the fat, when mixed with the active cannabinoids, is to help with absorption during digestion or application, which is a perfectly useful way to incorporate fats when dosing with cannabis. What patients quickly realize is that with precise decarb, so little flower or kief is needed that direct infusion is like sprinkling pepper on an entrée or adding vitamin powder to a smoothie. For patients who want a butter or oil to use for canna culinary purposes, a quick extraction after decarb is all it takes for maximum ease and potency. Fact: Fats and alcohol aren’t needed in order to decarb or administer cannabis, but they can be useful to pair with activated cannabis to aid in digestion and absorption. Shanel Lindsay is founder of Ardent Cannabis and creator of the Nova decarboxylator, edible caps, and sublingual wraps. She is certain that with increased education, research, and reliable clinical data, patients and doctors—even those who have not previously considered cannabis as an option—will discover it is a legitimate, viable, and safe treatment. A special thanks to our testing provider, MCR Labs, who performed the HPLC testing outlined in this guide at their ISO accredited cannabis testing facility in Framingham, MA. Don’t waste another ounce on a partial decarb. Get full activation with a NOVA. Fascinating! I will have to have one of these now. Making medicine just got more precise and much easier. Thanks Ardent! I own a nova. I love it. I did not know that concentrates are not decarbed. How about Rosin? Although I expect the Nova would be better, its possible to get good results w a kitchen oven if you use an oven thermometer and monitor closely, opening the door or turning off the element periodically to maintain a more or less consistent temp. I shoot for 290 F for 25 min but it will fluctuate between 310 and 275 so sometimes i adjust the time accordingly. I realize this is not optimum but it does work and the end product is quite effective. I recommend starting at 1/16 tsp of ground material or less so as not to get sick and keep the dosage consistent so as not to decimate your stash as your tolerance rises. It kicks in from 45 min to 2+hours depending on what you have in your stomach b4 dosing. The Nova is out of my price range but if someone wants to send me one I will test it thoroughly and broadcast the results widely. Very good article. As the myths are exposed patients can enjoy more medicine now that Ardent can save them time and money. Ardent will make it possible for medicine to truly be accessed efficiently and effectively. Please advise… THC & CBD need different times & temps to decarbox…… how is NOVA addressing this! Recently purchased, got great results with the NOVA. I’m told decarboxilation will happen automatically while cooking, is that true? I purchased a Nova Decarber some time back and I am thrilled with it! As I have continued to experiment with extractions for culinary purposes, I recently read about how blanching my flower in water could remove impurities and make for an overall cleaner finished product which is ideal for my culinary efforts. My question is how dry do I need to get my flower after I have blanched it before I place it in my Nova to decarb? Should I strive to get it so dry as possible before placing it in my Nova or is a little moisture from the blanching process ok? Would I need to adjust the amount of time, perhaps a cycle and a half, I decarb my blanched flower if it is still a bit moist from the blanching process? You can absolutely smoke and vape your cannabis after decarbing it! Decarbing is a required process for any cannabis product. A full decarb will give you a more potent product for your money, regardless of how you will be consuming. So if you will be smoking a joint, rolling it with decarbed bud will give you a more potent starting material and more mg’s of THC in your lungs. I ordered my Nova yesterday and I can’t wait! NOVA takes the guesswork out so no waste!